Interesting example of one of the low end Townsend models, 1930s. 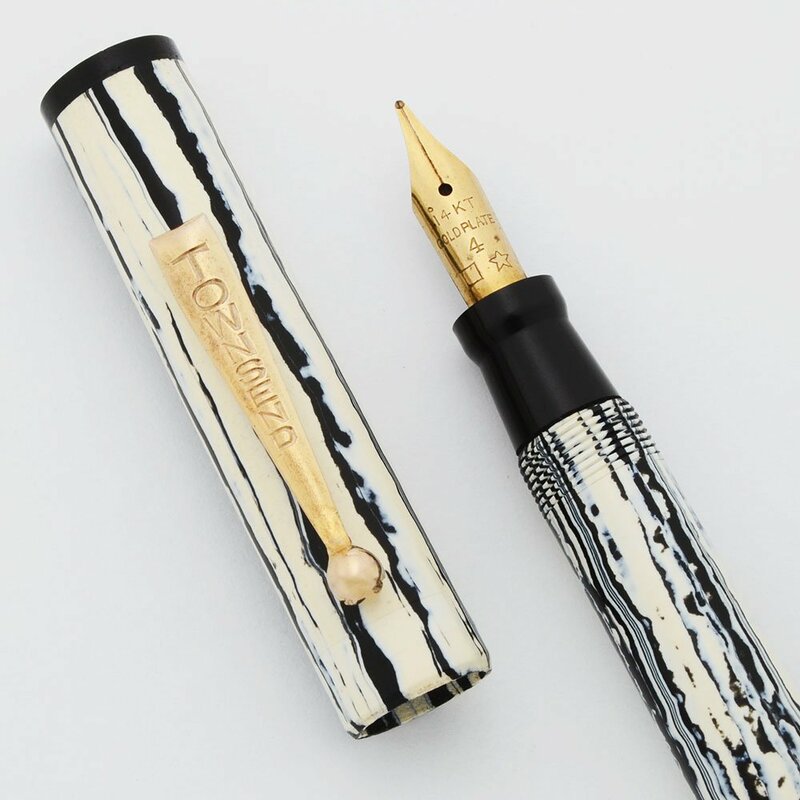 White with irregular black lines and gold plated trim, and a gold plated #4 nib. Excellent working condition, restored lever filler. Product Name Unknown. Townsend was a less than top tier maker, but this is one of their more interesting pens. Color White with black variable lines. Gold plated clip, and lever. Nib Medium #4 Gold Plated nib. There is a square icon and a star icon on the nib. No tipping material. Condition Excellent condition for this smooth, unusual and interesting patterned pen. There is light scratching throughout with a few long thin lines of scratching on the cap. The cap lip is a little rough around the edges. The cap has two distinct parallel horizontal lines running around the entire bottom, a subtle feature that is not a flaw. The clip looks great. The lever is a little loose fitting. The "Townsend" imprints on the clip and lever are clear. No cracks, chips, dents, or dings.